Yes, that Batmobile. It was noisy as hell and kind of slow, but still… THE BATMOBILE! So we drove the Batmobile from Batman vs Superman. And also Bruce Wayne's car. How come? Because Jeep made Bruce Wayne's car, and they were also involved with making the Batmobile and that's how movie promotion works! The thing to bear in mind about the Batmobile, and apologies if this seems patronising, is that it's not a real car. Well, it sort of is, but it's more of a prop than a vehicle… Although it can be driven and it is awesome. For instance, the in-car infotainment system is a blank, plastic screen. Furthermore, all the numerous switches don't do anything. Even the front machine guns don't work, so in that respect it's less powerful than the average souped-up Vauxhall Corsa around our 'hood'. The Batmobile weighs about 3.5 tonnes, pulls about 500 BHP and has what car experts would call 'f**king massive wheels'. The main thing that results from that is that it is horribly noisy - rather like the sound of sheet steel being torn in two - acceleration is sluggish, and deceleration is quite perilous for anyone trying to film it coming to a halt from dead in front, as this photographer found out. Not in a fatal way, happily. We did a lap of the airfield track at Bicester Vintage - a ridiculously bucolic location, about as far from Gotham City as one can get, although we have heard that things can get pretty rough when its sales time at the nearby Bicester Shopping Outlet Fun Retail Buy Stuff You Don't Need Village. We believe that's its full name. Driving straight was absolutely fine. We had no problems with that, apart from the way the rending metal sound from the transmission rapidly crescendoed from merely noisy and unpleasant to a deafening industrial whine. Taking even a rather leisurely corner was quite hairy, not least because there are no seatbelts and nothing much holding the doors closed. Top speed achieved: maybe 35mph? We could have probably caught the Penguin, if he was on foot, and featured in Batman vs Superman (but he doesn't). It felt a lot faster, not least when the brakes were applied, revealing a stopping distance of approximately a Gotham City block and a half. Was it a cool experience? Of course it was; it's the Batmobile. Was it an enjoyable one? Mmm, yes, guess so. Could you go to Tesco in it? No: it's about half an inch off the ground at the front, so the speed humps would be just too awful. Also there's no boot. And no rear-view mirrors. Although there are indicators, so at least you wouldn't have to suffer the ignominy of doing hand signals (as opposed to Bat signals) in the Batmobile. What was both a cool AND enjoyable experience was driving Bruce Wayne's Jeep Renegade (or at least the limited edition Jeep Renegade that's coming out to commemorate the universally-loved-by-critics Batman vs Superman movie). T3's Spencer Hart drove it expertly around an obstacle course involving running it on two wheels along logs, driving through a recreation of the Batcave and going up a massive see-saw thing, while I caught up with some emails in the back. There'll be a proper review along shortly. 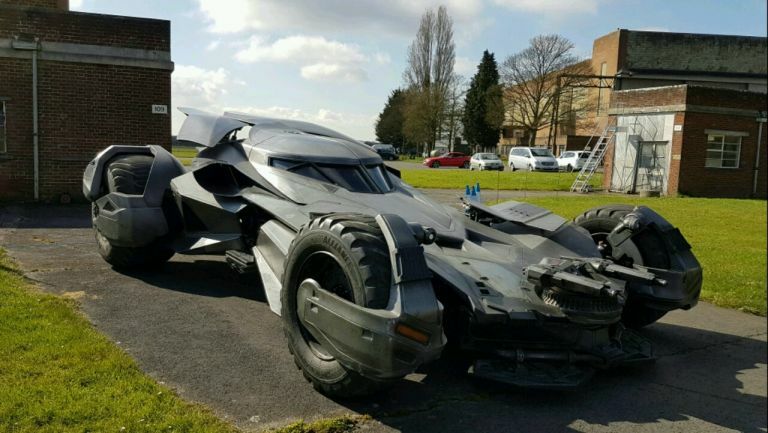 The good news is that if you go to this website, you may get the chance to come and drive the Jeep Renegade and see the Batmobile for yourself this weekend, in Bicester. The bad news is that you won't be able to drive the Batmobile because only we can do that. Only us and Batman are sufficiently cool. Sorry.